Bred by Richard & Sue Lust (Yeguada Iberica), Owned by Anabel Jay (Epona Stud). 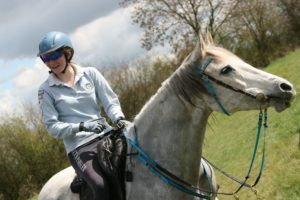 Keeper and Endurance Rider Rebecca Parsler. What an adventure, my first ever “overseas” competition as well as my first visit to the Island. Completely different terrain and new challenges to our home turf, as well as the longest multi-day class we’ve done to date. 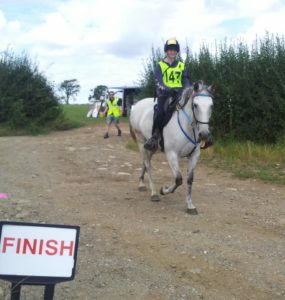 Polly has really been getting the hang of this whole endurance thing over the last year, we made it to advanced at the end of last season and she’s shed many fat rolls to reveal a surprisingly fit looking if not exactly streamlined horse. Polly (really Iberica Paloma) is a 13 year old Hispano Arabe mare who I’ve been riding for the last couple of years. 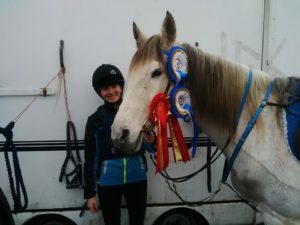 She was loaned to me from the Epona Stud so I could help them prove the breed as a competition horse in the UK. The breed is well known as a sport horse type in Spain although I have to admit I’d never even heard of a Hispano Arabe before turning up to try Polly. 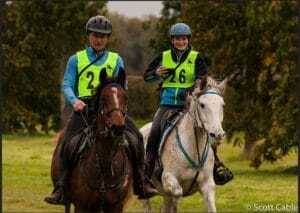 She is very different from your typical endurance horse (and about twice the size) but I can’t fault her stamina and attitude towards the sport. When we first brought her home she was just backed after spending her first 11 years as a brood mare, these days she looks very different, lots of hard work and running around Milton Keynes has trimmed her right down! Even so, this ride was a real challenge for her. At home we have flat, artificially surfaced tracks littered with pedestrians, underpasses, canal boats and sometimes giant flags, banners or bouncy castles. Polly must be bomb proof right? Ready for anything? Not so much. Bred by Susan Disney (Willowdell Stud). Owned & Competed by Claire Richards.